In the previous post we installed the RabbitMq service on Windows. I think you’ll agree that it wasn’t a very complicated process. We then logged into the management GUI using the default “guest” administrator user. We finally looked at how to create users and virtual hosts. We said that a virtual host was a container or namespace to delimit groups of resources within RabbitMq, such as “sales” or “accounting”. We also created a new user called “accountant”. In this post we’ll start working with RabbitMq in Visual Studio. We’ll in particular start exploring the RabbitMq .NET client library. Note that although the management UI opens on port 15672 the correct port number for access in code is 5672 for regular connections. If you set up TLS for your RabbitMq instance then the correct port will be 5671. This message usually indicates a problem with the connection string. Remember that the IConnection object is thread safe and can be shared among multiple applications. 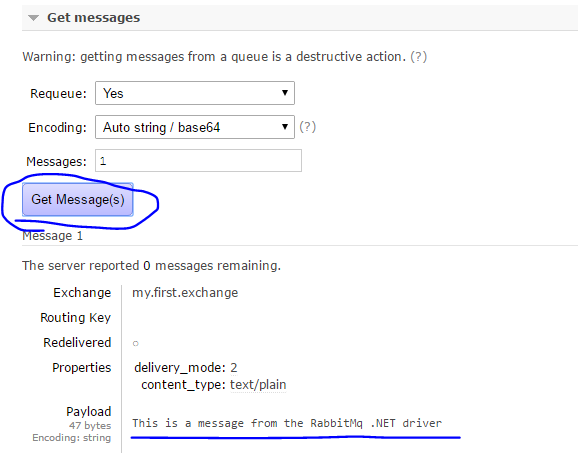 We also mentioned that an application communicates with RabbitMq through a channel which exists within a connection. A connection can have multiple channels to enable parallel communication of multiple threads. Each thread should have its own channel. Keep these advantages and disadvantages in mind when you’re deciding which persistence strategy to go for. Later on you can always simulate a RabbitMq server restart by right-clicking on the above node and selecting the Restart option. All non-durable resources will be wiped out from memory but the durable ones will survive, including durable messages that have not yet been acknowledged by any client at the time of the server crash. The third parameter, i.e. “true” sets durability to true. Then the “false” stands for the auto-delete option. Setting auto-delete to true for exchanges and queues means that they are automatically deleted as soon as they are no longer used, i.e. there’s no channel using them. The last parameter is a dictionary object where we can pass in some further options. We won’t worry about that right now so we set it to null. Here we have the queue name, the exchange name and then the routing key. We set the routing key to an empty string to indicate that we don’t need any. The code seems to have worked well. The great thing is that you can run this code as often you want. If the declared resource already exists then the code will not do anything, i.e. you won’t get an exception if you declare the same queue twice or more often. You can also restart the RabbitMq service in the Services window to simulate a server restart. The resources should still be there. IBasicProperties lets us set a wide range of properties for the message. Here we only use two of them. We want the message to be durable, i.e. persistent. We also declare the MIME type. 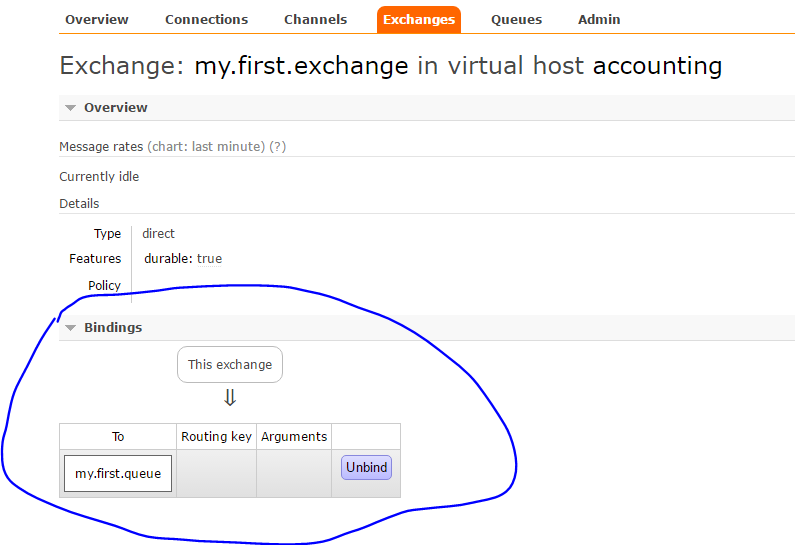 We then build a PublicationAddress object with the exchange name, the exchange type and the empty routing key. We finally publish a message which must first be transformed into a byte array. That’s enough for now. We’ll continue our exploration in the next post by looking at how to get messages in code. Hi Andras, thanks again for posting. I got everything to work with the ‘/’ virtual host, but not with the new Vitual Host (accounting), do you know of any reasons why this is ? Hi Andras. 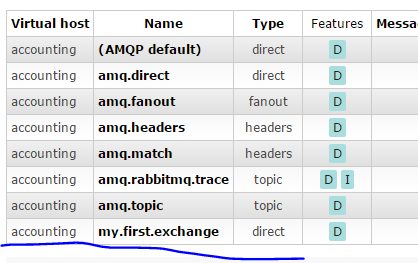 I was not getting any exceptions as such, I simply was not seeing the newly created exchange or queue on the RabbitMQ Managment console, but I have just figured out what the problem was => Permissions. I was signed in as ‘guest’, not ‘accountant’, and as such it would not allow me to view the exchanges or queues for the ‘accounting’ virtual host. After setting permission for ‘guest’ on the ‘accounting’ host, I was able to view everything. Sorry for troubling you with such a ‘vague’ question, and thanks for taking the time to respond. Hi Andras, many thanks for the update. Great and very useful blog!